My friend is getting married. The wedding is in August on the East Coast. I won't be going, but I am helping throw the bridal shower and the bachelorette party. I also helped with the invitations. And I have to ask: why do people get married? Kate's excited about the wedding. She's held on to that through the process of planning a wedding on the other side of the country. I have to admire her enthusiasm. This business is not easy. And I wouldn't call it "fun" either. This Saturday, I sat with Bride Kate and Co Planner Melissa. We mapped out everything that needs to be done in the next three weeks for the shower. 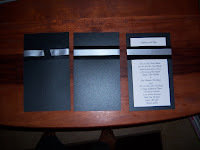 Then we got down to the business of invitations. Kate ordered invitations that needed a little added love. They were nice, but she wanted the nicer. So Melissa had the fantastic idea of adding silver ribbon. Kate's colors are black and silver, so it really was a good idea. All Kate had to do was buy the ribbon. That turned into a two month, bi-state adventure. But by Saturday we had all of our ingredients. All we had to do was glue silver ribbon onto the center of the invitation banner. Once the glue was dry, we inserted the actual invite card. The end result was beautiful. Too bad the work didn't stop there. Complete invitations are not stuffed invitations. So don't ever be fooled. We couldn't stuff the envelopes until we had stamps for the reply cards. We also needed registry cards. Melissa left, Kate and I shut down shop, and went shopping. That was another eye opener. Not all post offices have been upgraded in the last 50 years. There are some that still have that small town look, without the post office logo and with just a small set of letters declaring it a United States Post Office. The USPS changes its rates in May - possibly as a conspiracy against brides. Kate's invitations (with registry information and reply cards) weigh a little more than a pound. That means they need $.59 stamps. As the postal rates changed last month, there are only two $.59 stamps available. One has a beautiful landscape with big letters reading "Minnesota." The other has an old smiling man wearing a Hawaiian shirt and a lei. The old man is James Michener. He's a deceased Pulitzer Prize winning author. He is not, however, what any bride in her right mind would want to send on wedding invitations. Unfortunately he's what Kate's got. There is a cluttered store near Decatur and Oakey for people planning weddings. It's called Chic Favors and Gifts. It has everything for every bride in a very small space. I even found a black bride doll wearing an off white fishing vest over her gown and casting a line. There are hundreds of items, very few are in stock, but the saleswoman is very insistent she can help. There is a very specific way to stuff wedding invitations. There is a specific way to stuff reply cards. There is a specific way to address envelopes to couples, doctors, married women who keep their maiden names, etc. One day is not enough to assembly and package wedding invitations. Kate continued the madness on Sunday. Melissa had to work and I had a hair appointment. I just can't wait until we get closer to the shower.